This fascinating field in Cepheus features the the dark nebula LDN 1217 (aka Barnard 175). 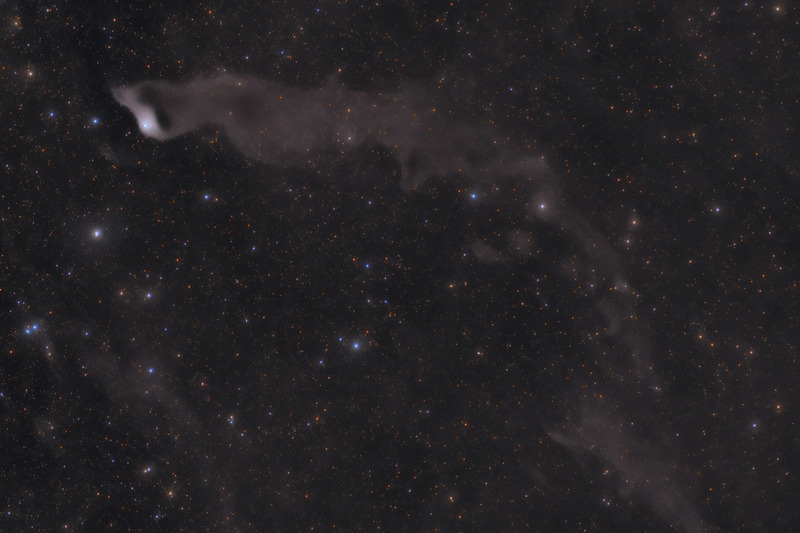 LDN 1217 is a Bok globule - a region where dust condenses to form protostars. The dark nebula is dimly illuminated by ultraviolet light, yielding a reddish glow characteristic of Extended Red Emission nebulae (EREs). On the left side of the image is the blue reflection nebula, vdB 152 (aka Cedarblad 201). The reflection nebula is illuminated by the bright star embedded within it. Curiously, though, the star's motion through space indicates that it is not formed from the condensing nebula - rather it is passing through the nebula. In this image, North is to the right. This image is cropped to 52% of the original image. Notes This is my first light image for my "dropped in a lake" Nikkor 600mm f/4 lens. While I need to do a little work to better align the optics in the lens, it still is performing quite well. I'm particularly happy with how relatively tight the stars are in this image, and I'm quite pleased with the nebulosity I was able to bring out in this image.